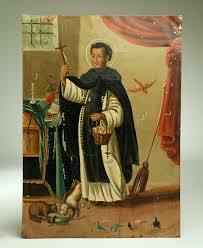 Martin de Porres is the patron saint of Mexico, mixed-race people and all those seeking interracial harmony. Born in Lima in 1579 he was the illegitimate son of a Spanish nobleman, Don Juan de Porres, and Ana Velázquez, a freed slave of African and/or possibly indigenous descent. Abandoned by his father, Martin grew up in poverty. By law in Peru, descendants of Africans and Indians were barred from becoming full members of religious orders. The only route open to Martin was to ask the Dominicans of Holy Rosary in Lima to accept him as a donado, a volunteer who performed menial tasks in the monastery in return for the privilege of wearing the habit and living with the religious community. Following many years as a servant, the Dominicans dropped their racial rules and allowed him into their order where he served as a priest/nurse practicing indigenous herbal medicine. Martin de Porres is often depicted as a young mulatto friar wearing the old habit of the Dominican lay brother along with a broom, since he considered all work to be sacred no matter how menial. He is sometimes shown with a dog, a cat and a mouse eating in peace from the same dish. As with many saints, he was known for his abilities to communicate with animals. Near most every church entrance in town is a statue of St. Martin de Porres. His feast day is not widely celebrated in San Miguel as it falls the day after Dia de Muertos.